Campers, boats and trailers are all significant investments. What is it worth to you to protect yours from damaging road debris? 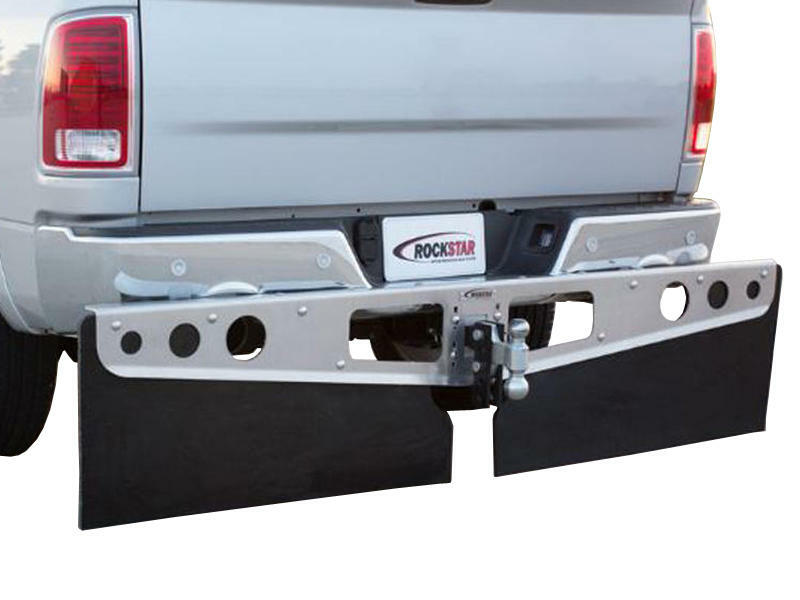 Avoid costly repairs and retain maximum resale value of your boat, camper or trailer by investing in ROCKSTAR™ Hitch Mounted Mud Flaps. Made model specific for the best possible fit, ROCKSTAR™ Hitch Mounted Mud Flaps contour to fit your truck?��s bumper and act like a shield to deflect rocks and other road debris away from what you tow. Easy to assemble, remove and re-install. Mounts to hitch with no drilling required. Attaches with an adjustable clamping system. Convenient frame openings offer quick access to safety chains, pins and wiring. Simply pull the hitch pin to remove. Please note: If you have a fitment inquiry, feel free to call us to check on your application. Rockstar makes four different rubber options. Standard, XL, 2XL and 3XL. This universal kit contains the XL. Fits Designed to fit pickups and SUVs with center bumper steps, including Toyota Tacoma, Chevy Tahoe, Nissan Frontier & Nissan Titan.